If you’re looking to build your own iPod or iPhone stereo, AirPlay audio system, or desktop audio system, you could buy self-powered speakers, such as computer speakers or studio monitors. But with a small integrated amplifier, which combines a preamplifier’s volume-control and source-switching features with a power amplifier for driving speakers, you can take advantage of the vast selection of passive (non-amplified) bookshelf speakers, which range from inexpensive, do-it-yourself speaker kits to slick-but-pricey audiophile models. Such speakers are often found as part of a small home audio system, but they can also be right at home in your bedroom, kitchen, or office—even on your desk. Small, inexpensive amplifiers usually produce around 20 watts per channel when paired with 8-ohm speakers (the most common impedence for compact speakers). While a walk through your favorite big-box store might suggest that amplifier power ratings in the hundreds of watts are necessary, a 10- or 20-watt amplifier is usually more than enough power to fill a normal-sized room with sound. While I’ll be looking at a few dedicated small amplifiers in a future review, I recently had a chance to test a number of models that also include a built-in digital-to-analog converter (DAC). This feature makes these models particularly useful as part of a computer-based audio system, or when paired other digital components such as Apple’s AirPort Express, as the DAC extracts the source’s digital audio signal—avoiding the source’s electrically noisy internal components—and uses higher-quality circuitry to convert this signal to an analog signal that the amplifier can send to the speakers. Each of these models also includes a built-in headphone amplifier separate from the main amplifier—this dedicated circuitry should do a better job of driving headphones than the built-in headphone jack on a computer, iPhone, iPod, or other device, and also allows use of the built-in DAC when listening to headphones. 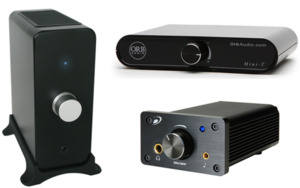 We tested four small integrated-amplifier/DAC combinations from three different companies. Each is smaller than a standard stereo component and can provide enough power to drive a pair of bookshelf speakers to reasonable listening volumes (and, depending on the combination of amp and speaker, even to unreasonable ones) in a small- or medium-size room. However, the four models vary widely in price, design, features, and sound quality. The least-expensive model I tested is Topping’s $180 TP30 Class T Digital Mini Amplifier with USB-DAC ( ), distributed in the United States by Parts Express. The TP30 is approximately the size of paperback book or an external hard drive, at 8.1 inches deep, 4.1 inches wide, and 1.8 inches high. The black, extruded-aluminum enclosure sports a silver, brushed-aluminum faceplate—a look that’s clean but generic. Two switches on the front control power and input selection (the latter allowing you to choose between the unit’s analog- and USB-audio inputs). There is also a sturdy volume knob with an overly bright blue LED encircling it, and a 3.5-mm (1/8-inch) headphone jack powered by the built-in headphone amplifier. The rear of the device hosts an input for the included power supply brick, small binding posts for connecting speaker wire (which can be bare or terminated with banana plugs), and the aforementioned audio inputs: left and right RCA for analog and USB type B for digital. When using the USB input, the TP30’s DAC can decode audio up to 16-bit, 48-kHz. 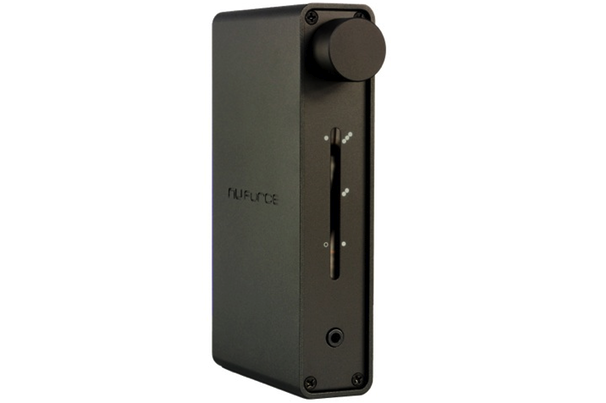 NuForce is a company that began as a maker of high-end audio equipment, but later branched out into personal-listening gear such as headphones and compact stereo equipment. The latter category includes the versatile $349 Icon-2 Integrated Desktop Amplifier ( ), a small, stylish, integrated amplifier available in red, blue, black, or silver aluminum—the silver Icon-2 the company sent Macworld has a Braun-esque minimalism and looks great next to an aluminum MacBook. The unit is slightly smaller than the TP30 at 6 inches tall, 4.5 inches deep, and an inch wide (when positioned vertically using the included silicone base). The front of the Icon-2 features two knobs: one for turning on the unit and controlling the volume level, and the other for choosing the audio input. The front panel also hosts a 3.5 mm headphone jack powered by the built-in headphone amplifier, and a soft-white LED that indicates power. On the back panel are the Icon-2’s three audio inputs: two analog (a 3.5-mm stereo-input jack and and left/right RCA jacks) and one digital (a USB type B jack). Also on the rear panel are a connector for the device’s power adapter, a 3.5-mm line-out jack (for use with a subwoofer—the company says the Icon-2 can be damaged if this jack is used without speakers attached), and left and right speaker connectors. When using the digital input, the Icon-2’s DAC can decode high-resolution audio up to 24-bit, 96-kHz, and a company representative told me the Class D amplifier provides up to 18 watts per channel into 8 ohms. Returning to the speaker connectors, most amplifiers use traditional speaker connections such as binding posts or spring clips—connections that work with basic speaker cable. NuForce, however, uses ethernet jacks on the Icon-2, which means you use ethernet cable in place of traditional speaker wire. Indeed, NuForce includes with the Icon-2 a pair of the company’s unusual speaker cables, which have a standard RJ45 ethernet plug for the amplifier end and a banana plug on the speaker end. ethernet cable is well shielded for audio applications and can handle the Icon-2’s power levels, according to a NuForce representative. If your speakers can accommodate banana plugs, and if the included cables are sufficiently long, this unorthodox solution is very convenient, letting you avoid the traditional process of cutting and stripping speaker wire. If you need longer wire, you can construct it yourself from ethernet cable using a wiring diagram on NuForce’s website, or you can use an RJ45 coupler to attach additional, standard ethernet cable and extend the included speaker cables. However, NuForce’s banana plugs are not compatible with speakers that use spring-clip connectors, though a NuForce representative said that the company would modify its cables for users that need bare wire. It’s also relatively easy to modify the included cables, or any ethernet cable, yourself, but this defeats the purpose of NuForce’s easy-to-connect cables. Compatibility aside, I did find that the relatively stiff cable was a bit unruly. I think the use of ethernet cable will be convenient for most people, but somewhat of a pain if you’re in the minority that needs a more flexible solution. The Dia has only a single knob on the front. Pushing the knob once turns on the amplifier, while pushing it again cycles between the Dia’s three inputs (the current input is indicated by white LEDs on the front pannel). Pushing and holding the knob turns off the amplifier. Rotating the knob adjusts the volume, with the volume level indicated by a column of blue LEDs on the front panel. The Dia includes the same silicone base and power adapter as the Icon-2, but does not include speaker cable. 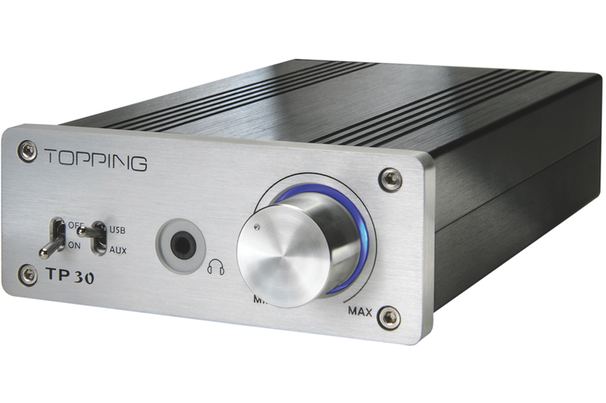 Put simply, if your source equipment has optical- or coaxial-digital output, and you can get along without USB and analog inputs, the Dia offers the same amplifier as the Icon-2 and a better DAC for $50 less. Except for the MacBook Air, every recent Mac includes an optical-digital-audio output, as do many HDTVs and optical-disc players, the Apple TV ( ), and the Airport Express ( ). iPods, notably, do not. 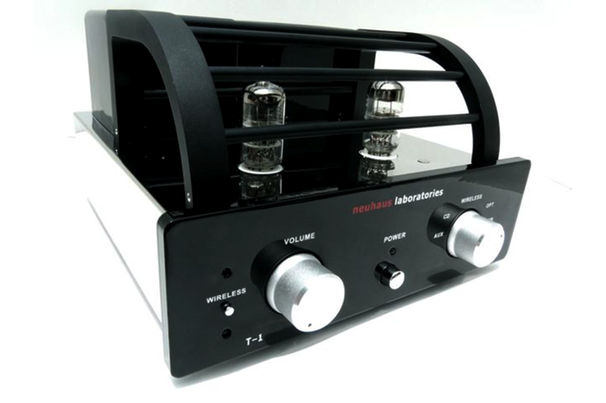 At $495, Neuhaus Laboratories’ T-1 Amplifier ( ) is in many ways the opposite of the Topping TP30: The T-1 is significantly larger (although still small compared to full-size stereo components), more expensive, and more feature-packed than the TP30. And while the TP30 uses a cutting-edge switching amplifier design, the T-1 incorporates old-school vacuum tubes. At 10.6 inches wide, 8.7 inches deep, and 5.9 inches tall at its highest point, the T-1 has about the same footprint as an iPad or a sheet of letter-size paper, and is, on average, about as tall as an iPhone. It looks sharp with a polished-stainless-steel body and a glossy-black face plate. (A white model is also available and looks similarly lovely.) The T-1’s two 6N2 vacuum tubes are proudly displayed near the front of the device, behind a black cage that discourages—but doesn’t prevent—touching (the tubes can get quite hot and are somewhat fragile). Those who have never used tubed gear will probably love the faint glow emitted by the tubes when the device is powered on. The T-1 also feels dense, implying solid construction and quality components. The unit’s front panel features two knobs, one for volume control and one for source selection, as well as a 3.5 mm headphone jack powered by the built-in headphone amplifier, a power button, a soft-blue-LED power indicator, and another button I’ll get to shortly. When it comes to sources, the Neuhaus has the most diverse set of inputs here: USB type B, which can handle audio up to 16-bit, 44-kHz; optical digital, which will decode up to 24-bit, 96-kHz audio; and two sets of analog RCA inputs. The T-1’s back panel also has a socket for the included power cord (the internal power supply means there’s no power brick), and a post to which you can attach the included antenna. Antenna? The T-1 also supports Bluetooth audio, allowing Macs, iOS devices, and other A2DP (stereo-Bluetooth) gear to stream audio wirelessly to the amplifier. The aforementioned front-panel button lets you disable Bluetooth (to keep your devices from automatically pairing with the T-1), and it also turns off the overly bright Bluetooth-status LED. The T-1 ships with a USB cable, an optical-digital cable with a 3.5-mm plug, a wireless remote control for adjusting volume, an Allen wrench for removing the tube cage, and gloves for handling the tubes. Speaking of those tubes, audiophile factions have long debated the use of tubes versus solid-state components. (The T-1 uses tubes for pre-amplification, while Class AB, solid-state circuitry is responsible for most of the 18 watts of output power. Class AB designs are less efficient but potentially better-sounding than Class T and Class D designs.) Solid-state factions argue that transistors have better measured behavior (including lower distortion) and are generally more powerful than tubed gear. Tube lovers claim that transistors sound sterile while tubes have a smooth, natural, musical sound. I corresponded with a Neuhaus representative about this design choice, and Neuhaus is clearly in the latter camp—the company’s representative extolled the usual virtues of tubes, but also pointed out that tubes help cover artifacts found in poorly compressed music files. And while tubes do have a limited lifespan, the Neuhaus representative told me that they should last at least ten thousand hours. When they do kick the bucket, the tubes cost $10 each to replace, and the representative compared the process to changing a light bulb.